I meet monthly with a small group of photographers in the pub to chat and share tips. We’ve also been setting ourselves a little project of choosing a word every month about which to take a relevant photograph. We’ve reached Q, and set ourselves the challenge of anything with ‘quad’ in it. The good thing is about this project is that we often have to look stuff up in the dictionary and so automatically learn as a by-product. 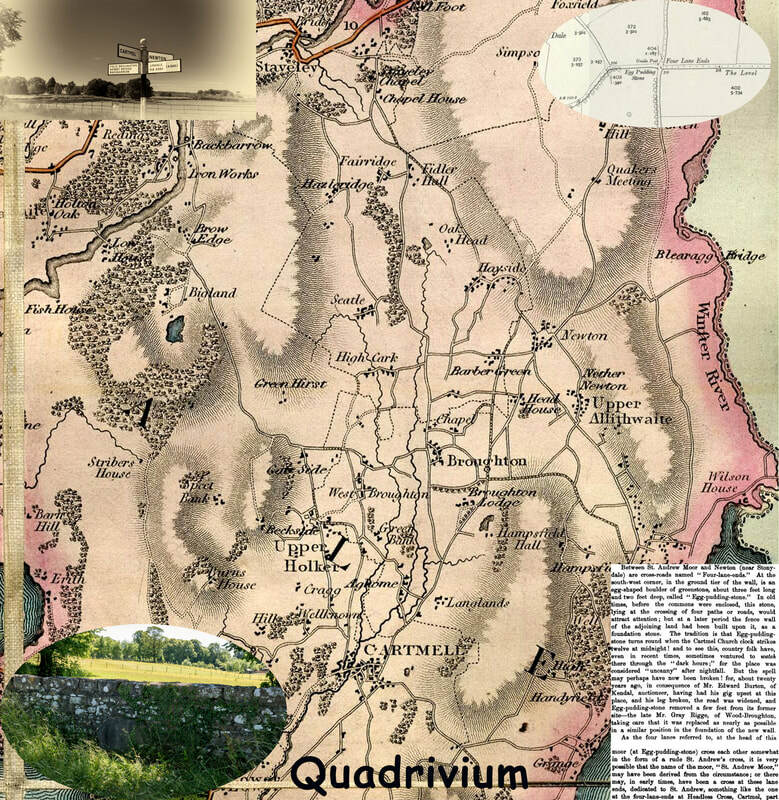 I was surprised to find “Quadrivium” which is not a word I had ever heard of. It is a word derived from the Latin roots quad- (four) and via (ways, roads); therefore a junction of four roads. It’s not often when hobbies and work overlap so perfectly! Now, to my mind, a junction of four roads generally means ‘cross-roads’ as in two roads crossing each other. However, in the Cartmel Peninsula there are actually two places officially named “Four Lane Ends”. One of them is of especial interest as it has something called the ‘Egg Pudding Stone’. This is an egg-shaped boulder of greenstone, about 3’ long. Before the commons were enclosed this stone probably marked the junction of the roads. Local legend has it that it used to turn round when the Cartmel Church Clock struck twelve midnight – but no-one ever actually recorded seeing this happen, because no-one would venture down there to watch it happen as it was too scary! However, in about 1850, an auctioneer from Kendal ‘had his gig upset’ at the junction and broke his leg (the records don’t say whether it was because the stone jumped out at him). The roads forming the junction were subsequently widened, and the egg-pudding-stone was built into the bottom of the new roadside wall. Thereby breaking its ability to turn round. So, I cycled off to the junction and took photos of the four fingered guide post, and the egg-pudding-stone to overlay on my photo of Greenwoods map. I was pleased to find that the stone has a benchmark on it (216’).